The staff appears to be a greenish blue orb surrounded by several spikes with a green-blue gem at the bottom. The staff itself can be found within Labyrinthian, but the section that it resides in is only accessible if you have the Torc of Labyrinthian from starting the quest The Staff of Magnus, one of the later quests from the College of Winterhold. The staff is carried by the dragon priest Morokei, and can be looted from his corpse once he's dead. 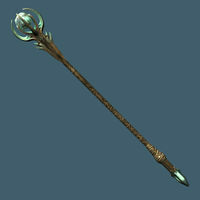 This staff also appeared in Morrowind, although with a completely different effect. A second staff may be lootable from Morokei. While confirmed to occur, the circumstances under which this happens are unknown; see the talk page for more information. The staff might not actually absorb health, even after the target has been completely drained of magicka. The staff will instead absorb a seemingly endless amount of magicka, even when the staff is fired at the target until completely drained of its charge. When wielding only the Staff of Magnus, your unarmed attack will increase in speed significantly. When placing the staff on a weapon rack in a Hearthfire home, the staff may vanish and be irretrievable.